There is a common misconception  that biodegradable plastics will eliminate plastic pollution. I just don't see that happening. 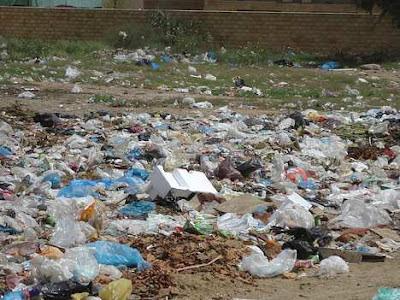 While the plastic will breakdown at some point (some point being strongly influenced by the amount of UV light and/or the temperature and/or the moisture around the plastic), the fact that the breakdown is not immediate means that the pollution will still be visible. Take a look at this picture. Imagine that all that plastic will completely biodegrade to CO2 and O2 over the next X months. Does that make this scene any less unattractive right now, here and today? Does anyone really believe that human behavior has changed so much that during the coming X months no additional plastic be added to that green field? Or are people going to keep tossing bags and bottles and whatever else out into the wild, replacing whatever is degrading with new material to be degraded? Pollution is a problem that requires an immediate solution, particularly visual pollution, while biodegradability is a long-term outcome. Until that magical day arrives where a piece of plastic will be smart enough to realize that it is now waste and needs to immediately decompose , biodegradability will do nothing for reducing pollution. Roadside and parks and oceans will look just as polluted as they do now. I've been careful in this post to always tie biodegradability to the idea of reducing visible pollution, and that is because I am not against biodegradability for other situations. Medical sutures and staples that biodegrade are essential for modern medicine, and there are other applications where biodegradability serves a specific engineering purpose. I am not a big fan of biodegradation of plastics in compost piles as it's the irreplaceable loss of a reusable material, but at least with composting the materials, no one is being oversold on expectations. That is not the case with biodegradable plastics as a way to eliminate pollution. Rather ironic, isn't it that I'm linking to a webpage entitled "Common Misconceptions" in order to correct the misconceptions posted there? That CO2 is a greenhouse gas is ignored too by proponents of biodegradability as a solution to pollution.